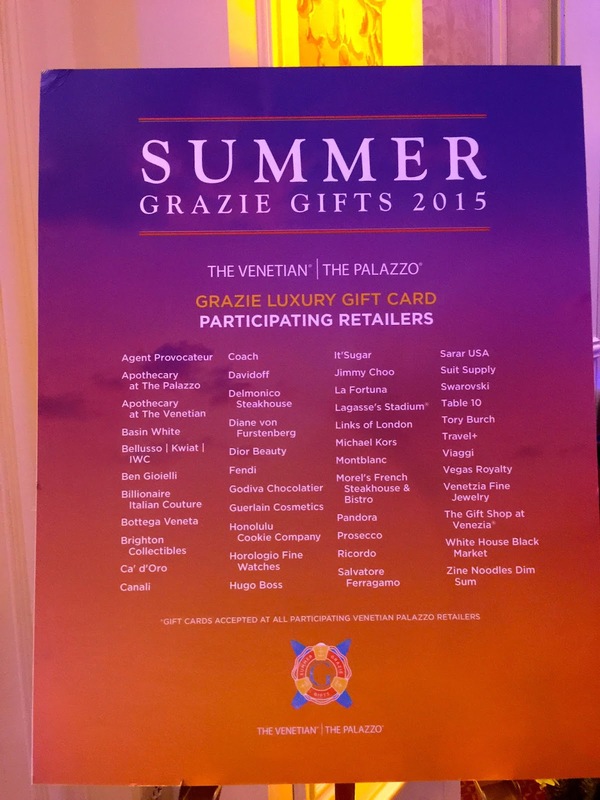 LAS VEGAS DAZE: Vegas in June with friends for Grazie Summer Gift Show! 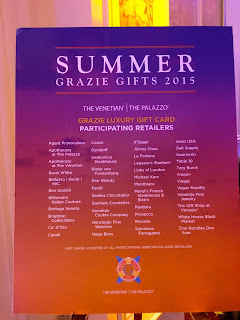 Vegas in June with friends for Grazie Summer Gift Show! The flight out of San Jose Airport on Southwest was on time and arrived at McCarran a few minutes early! I didn't have to wait long for my luggage and my limo driver quickly drove me to Palazzo where VIP registration had me in one of my favorite suites in the 900 even section on a high floor. 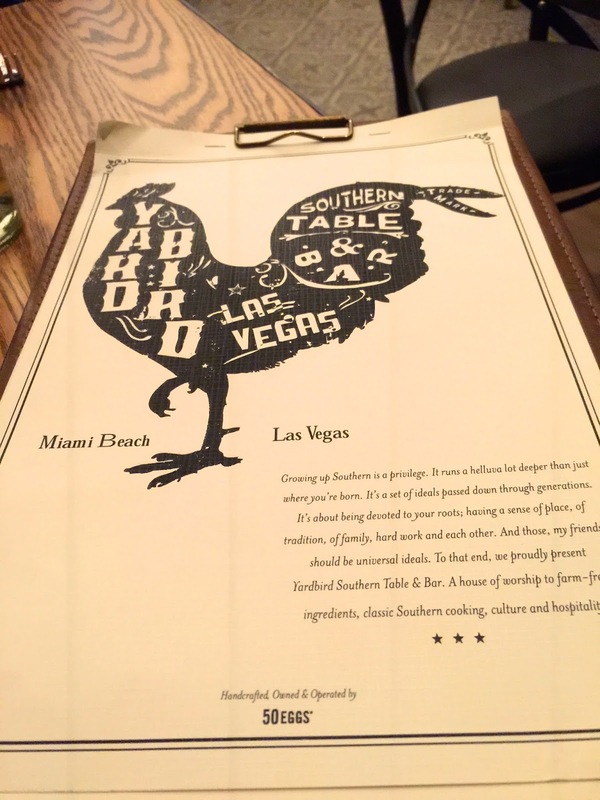 After dropping my luggage off in my room it was time to meet my friend Leah for lunch at Yardbird! 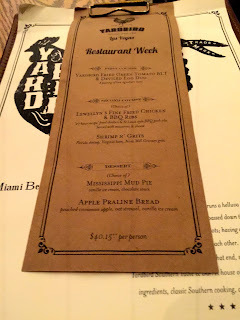 It was restaurant week but both of us passed on the menu because we didn't want so much food, however it was a great deal. I like spicy drinks and they didn't have any on their speciality drink menu but our server suggested that the bartender could make me a spicy jalapeño Margarita and it was very good! Leah and I share the appetizer BLT which is Pork Belly, Greens, Tomato Jam and house made Pimento Cheese. It was tasty! 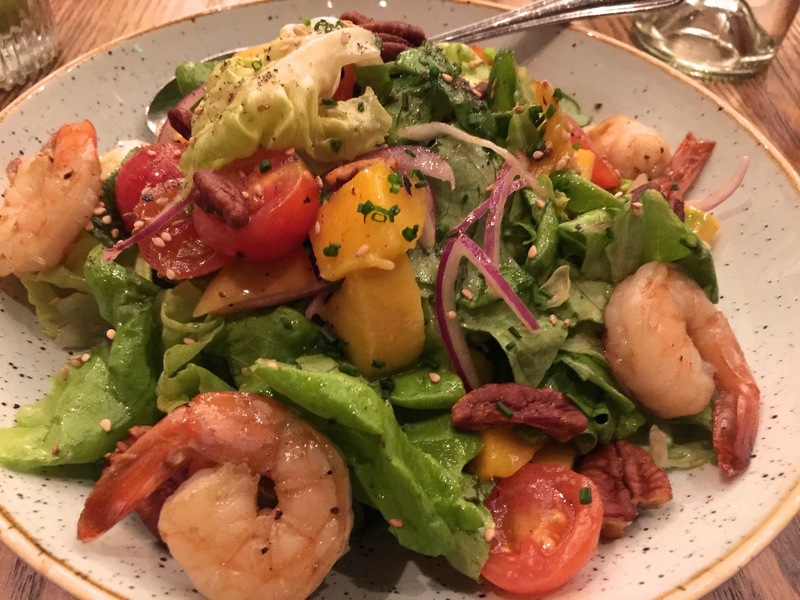 Both of us ordered the light and delicious Mango Salad with the addition of seared Florida Shrimp. After lunch we met up with Bill and his brother Nick to go to the Grazie Summer Gift Show and on our way there ran into our friend Alicia (Ladyclare). Alicia was in town for fun and also to work at EDC which would start in a couple days. 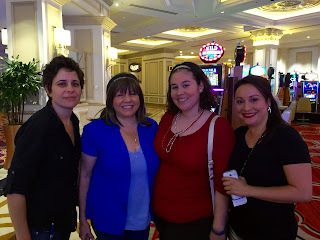 After a chat and a photo op, Alicia continued on to the casino and we went to the gift show. I would see Alicia later this night and we had a fun chat catching up on things. It was early afternoon and on a weekday so no crowds to contend with, so checkin was quick. We were told they were expecting big crowds that weekend and the lines would be long then. Summer Grazie gift points could be traded in for gift cards from Macys, Best Buy and other retailers or for slot credits in addition to the gifts on display. Assorted photos of the gift displays. 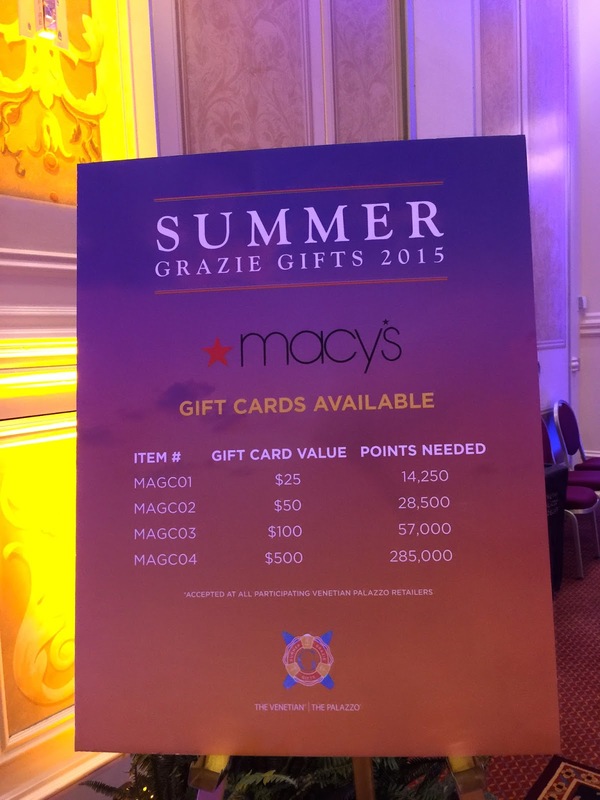 I ended up being boring and cashing in my points for $700.00 worth of Macy's gift Cards. 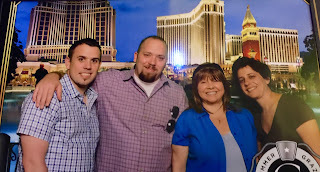 In addition to flavored waters and coffee they had a photo station set up with a Vegas/Venetian backdrop and we all received a complimentary photo in a nice simulated leather holder. 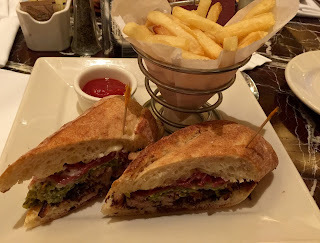 After the Grazie gift show we went our separate ways gambling while I met up with my friend Julie who was also staying at Palazzo with her husband for her birthday. 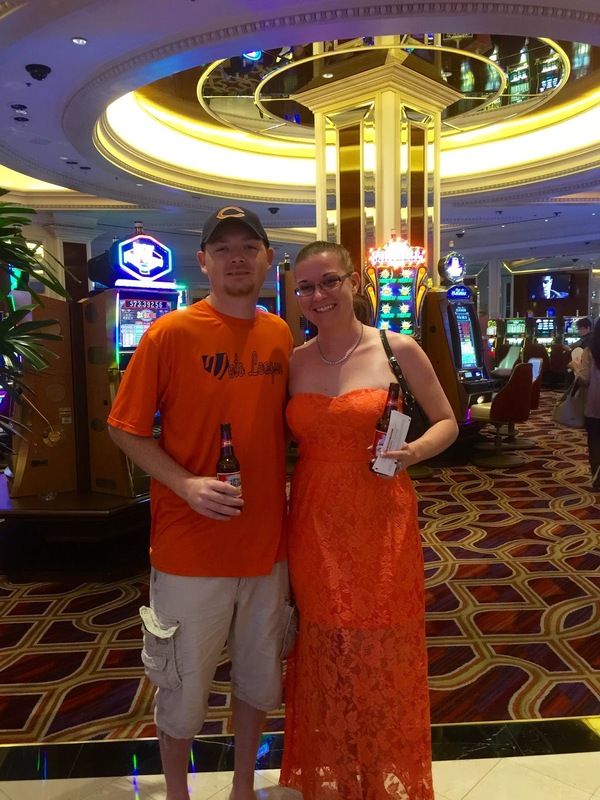 We decided to pool our money and play slots together in the Venetian High Limit Room. Julie suggested the dollar Sky Rider slot machine so we started to play that. At first it was slow going though we did have a hit for $106.00. Then all of a sudden boom, we got four rows of Sky Rider symbols for a hand pay of $1450.00! Two happy ladies! Julie and I had fun playing some other slots together but this was the only Jackpot. After Julie and I split up, I decided to play some Monopoly Luxury Diamonds to see if I could hit a jackpot on it like Gwen did at Aria in May. I had some nice hits on it, but no jackpot for me! I was having dinner with Leah tonight so we met up to play slots for a bit before dinner, slots like The Walking Dead, Hangover Pretty Awesome, Ellen and a couple others but no luck so no photos. We did have a bit of a fright when Leah briefly lost her iPhone 6 at one of the slots, but fortunately a honest person handed it in to security and they were just logging Leah's phone in to lost and found when we went up to report the loss. Whew! Thank goodness for the honesty of the person who found Leah's phone! Dinner tonight was at one of my favorites, Tao Restaurant! 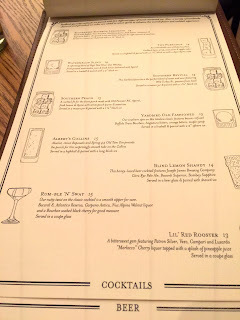 We had a nice corner booth and service was great, we were ordering drinks immediately. 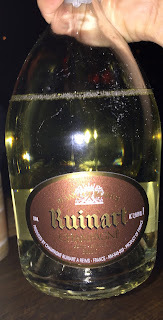 Leah knows her champagne and wines and picked out a great bottle of champagne for our dinner. It went down so easy! 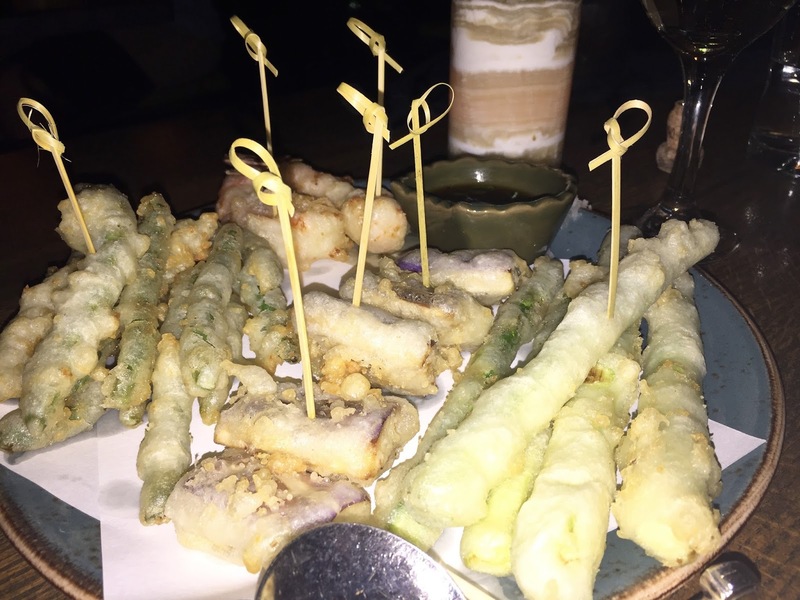 Every now and then Tao tweaks their menu. This is the latest version with a new entree or two. Leah also had a California roll or sushi, not sure what as I don't eat that. 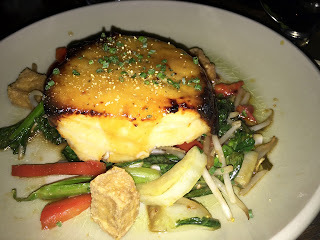 Of course I had to order my favorite which is the miso glazed Chilean Sea Bass and it was great as always. 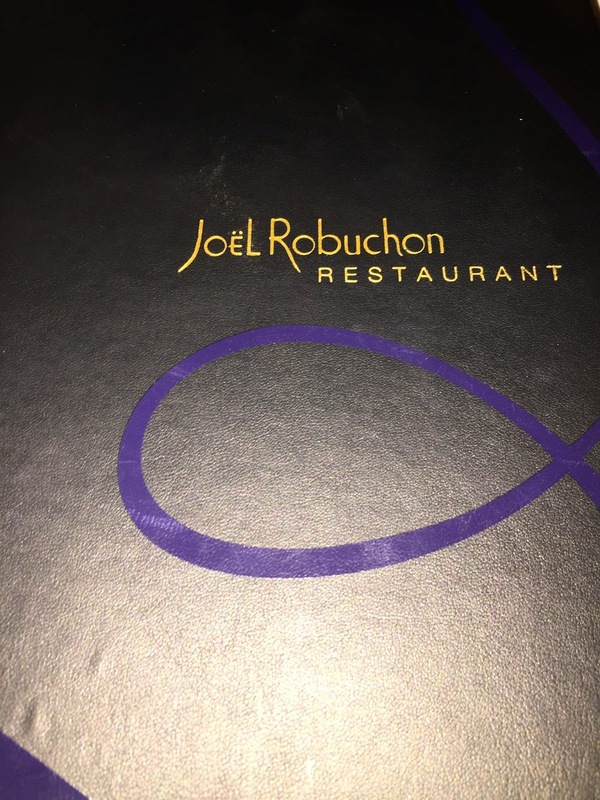 I believe Leah also ordered and enjoyed the Sea Bass. Dinner was delicious, our conversation was lively and we ended a wonderful dinner by sharing the Giant Fortune Cookie dessert that has chocolate mousse on one side of the cookies and vanilla on the other side. Thanks Leah for a great dinner! After dinner Leah and I played some slots in the Venetian High Limit Room and this was my best hit on dollar Quick Hit for the trip. Leah had some bonuses on Wheel of Fortune but nothing big. A couple ladies who like my blog and youtube channel contacted me to meet up in Vegas this trip. Since it was a short two day trip I asked them to both meet me at the same time outside the Venetian HL room where Leah and I had just finished gambling. Candy and Claudia were lovely and fun ladies and we decided to pool some money together and play a couple slots together, while Leah went off to play some of her favorite slots as she was leaving in the morning. We had fun on some Hangover Pretty Awesome slots and 88 Fortunes but unfortunately ended up losing our money. While this was the only evening I saw Candy I did see Claudia the next day and we played Lord of the Rings together but again lost. Sorry ladies, next time we will be winners!! After Candy, Claudia and I were done playing slots and had gone our separate ways I ran into Jason and Des in the casino! Jason and Des are friends who had just gotten married the day before in California and were spending part of their honeymoon in Vegas. We had a nice chat and I would see them again the next day for a lunch we had planned for this trip. For the rest of the night it was slots, slots, slots, though I would run into Jason, Des, Bill and Nick at various times to socialize. No big jackpots were won, I guess I needed Julie with me in order to hit another one, but I did have some decent to good hits during the night. The hit below was on Mermaid's Fantasy a new slot that I really liked. Always have to play the original and in my opinion the best of the Goldfish Slot Machines. For the last 6 months, I can't stay away from the 88 Fortunes slot or as my friend Gwen says the crack of slots! I went to bed around 3am that night and awoke in the morning to my favorite view at Palazzo overlooking the strip and the High Roller Wheel. I also used to like the view of Treasure Island with the Pirate show but of course Treasure Island ruined that view when they replaced it with shopping and restaurants. 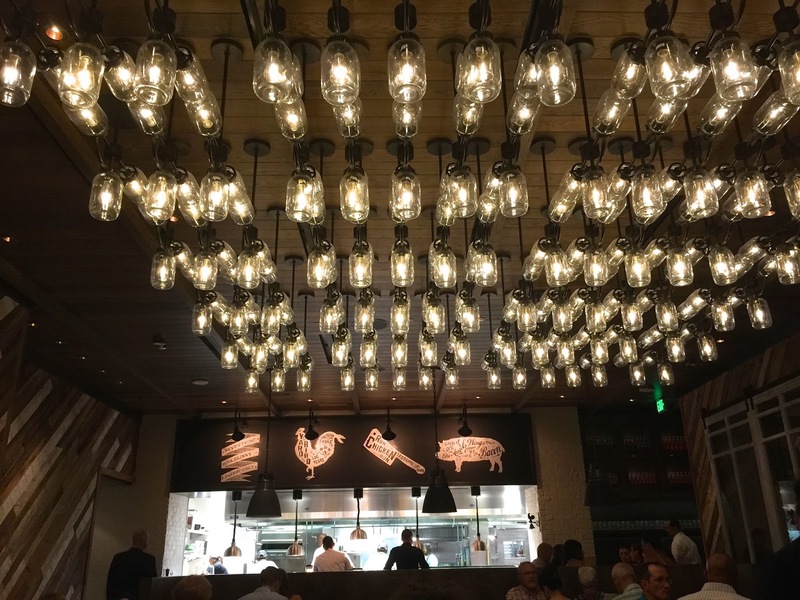 Lunch with Jason, Dessie, their daughter Kadie, Jason's sister Sidney, Bill and Nick at Grand Lux. Jason and Sidney shared a sausage, mushroom, pepperoni pizza. Des had a reuben with side salad. Below my Sonoma Salad that I frequently order. It was great catching up with Des and Jason, and hearing about their plans for a honeymoon cruise. Their daughter Kadie is a cutie and Jason's sister Sidney was very sweet. Jason also had a friend with him that he was taking to the airport that day who was nice and of course as always Bill and Nick are a blast, so it was a fun lunch! After Mermaid Fantasy I had fun and some good wins on various slots! Back to Sky Rider slot in the Venetian HL room for a couple minor hits. I can never get the bonus on the penny version of Sky Rider but I had several on the dollar version but unfortunately no jackpots! Best win for the day was a bonus on dollar Davinci Diamonds in the Venetian HL room. Here's the video of it for those who enjoy Davinci Diamonds! After dinner Noleman and I went to Venetian where we gambled for about 3 or so hours. Unfortunately all I could do was lose though Noleman was doing fine. I played so many slots that evening and all I had to show for it were a few minor wins and numerous losses. While Noleman and I were playing slots we ran into Bill and his brother Nick and they were having a lucky trip with lots of hand pays, especially Nick! 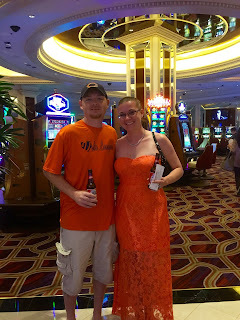 We also found Jason and Des back at Palazzo playing slots with Bill and Nick and they were having some luck too. Defeated at gambling at Palazzo this evening, LOL, I said goodnight to all and walked Noleman out to the taxi line. It was time to get some sleep as I had to get up early and catch a flight to Reno where my friend Manette was picking me up to take me to Lake Tahoe for a Meet that the JWE (Joker's Wild Gambling Emporium) message board was having there. Lake Tahoe was beautiful, the Meet was fun, a record number of hand pays were hit by many of the attendees at the Meet, including one on $5 Cash Wheel at Harrahs for $5,000 that Jason and I shared! I have some live play of us hitting this jackpot at the below link if you want to watch it. We weren't excited at all, LMAO! I hope to return to Lake Tahoe next year as it's a great vacation destination. If you would like to read about the Meet at Lake Tahoe you will find a live trip report thread on it at the JWE forum. 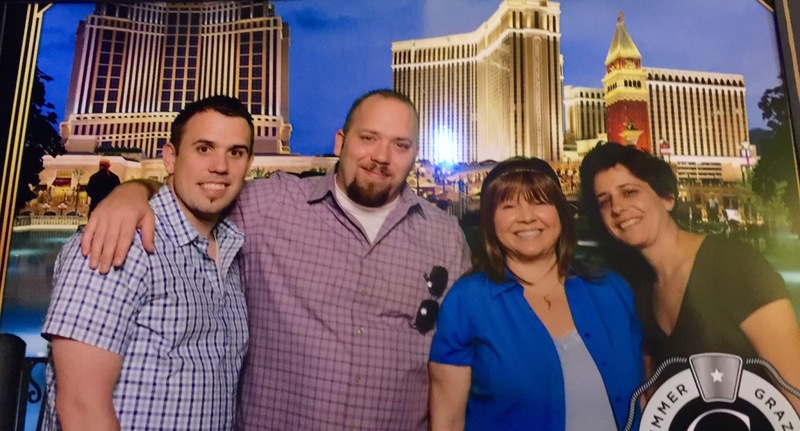 After Lake Tahoe, Manette drove me back home and I had only 2 weeks before I would be returning to Las Vegas to meet up with my Mother and friends for my birthday trip. I'm still in the process of writing that trip report up but eventually it will be here on the blog! Cheers! I love your blog! I've been waiting for a new post. :) Thank you!! My husband can even recognize your voice when I am watching live play on YouTube. (also sdguy) Ha! Quick question....Do you have any experience with the prestige level at the Palazzo? We are considering upgrading in December, but are curious about the type of food offered for breakfast. (i.e. Is it just cereal and danish? ) Any information you have would definitely help inform our decision. Thanks! Best Wishes and Good Luck! 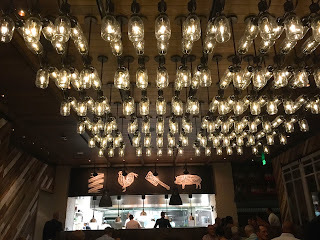 Sorry since I'm comped and Platinum level with Grazie, I have access to the VIP lounge that has food 24 hours so I have never upgraded to the Prestige level at Palazzo. You might ask that question on the Vegas board of Trip Advisor as I believe I've seen posts before from people who have stayed on the prestige level. I think V/P has some good room deals at the moment that include a room service breakfast so you might want to consider that if the pricing is good for that on your December dates. Thanks for letting me know you love the blog and videos! I'll be back at Aria with sdguy in late September for a convention we are going too so hope to have a few videos of us together. Have a fabulous time on your December Vegas trip and good luck! Great report as usual....they always make me hungry! 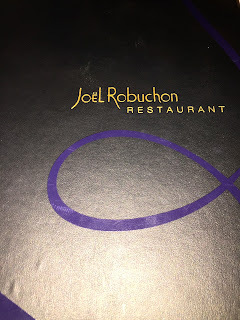 We had a great time at L'Atelier de Joel Robuchon in London and the whole service and food experience was amazing - I'd definitely recommend it if you're ever over here :) We'll have to check out the one in Vegas now so we can do a comparison. Enjoy your September trip and I'll keep my fingers crossed for a few handpays! 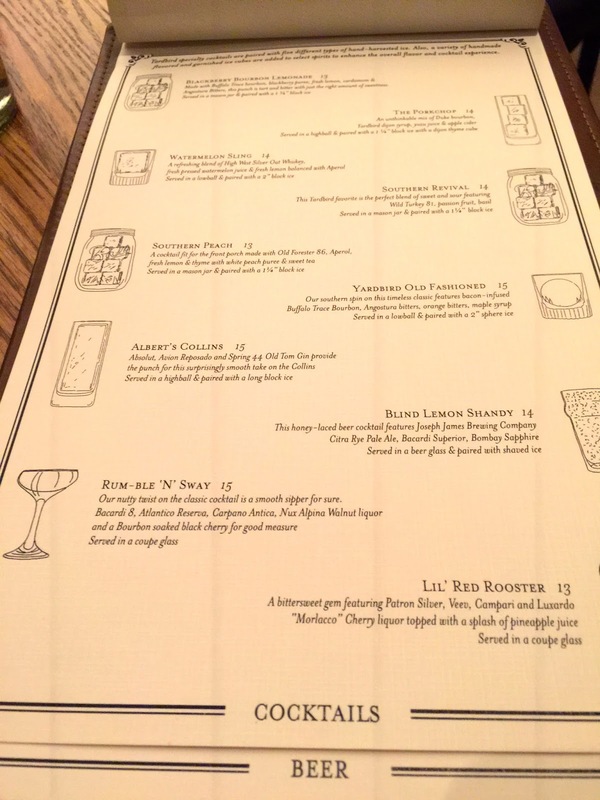 I saw your photos of dinner at L'Atelier and I could tell it was amazing, so glad you have a great birthday weekend! I haven't been to London for 8 years now but will eventually be traveling overseas again and will keep it in mind. I think you doing a comparison to the one in Vegas is a great idea! Thanks, September is for G2e mainly but I'm sure I'll get my gamble in too! hugs to you and Andrea! I love your blog and it is a real treat to read it all and look at the pictures. Keep up the good work! Thanks Garrett, it's always great to hear someone enjoys my blog! How about you jetting back and forth between Reno and Vegas LOL!! You did it for the sight seeing right???? Another awesome TR ..will see you next month to hit the big one!!! Cheers!!! LOL Mike, actually I did do that trip for the sight seeing, I still prefer Vegas over Tahoe. :) However, we had a nice boat ride on the lake and the beautiful scenery and cooler weather was a nice change from Vegas in June. See you next month and hope you are psychic about hitting the big jackpot! I love readings your TRs because it preps me for my next trip. I always show my friends your blog, and say "we have to play this!" or "we have to eat there!" Have a safe and fun trip this week! Darn it Mary, sorry we are missing by a day or so again. 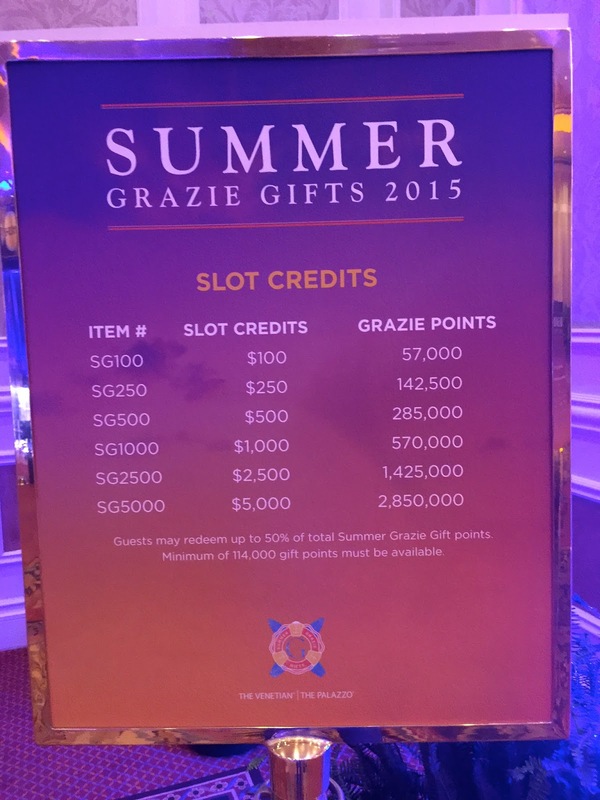 Have a fabulous winning trip at Palazzo this weekend. When you want to get together for lunch, just let me know!